Active or passive investing: what is the best approach? A panel of experts discuss the pros and cons in this video from Raconteur, in association with PIMFA and Investec Click & Invest. Don’t bother with bonds; cash could be king; and avoid volatility. Fundamental challenges face the pensions industry. 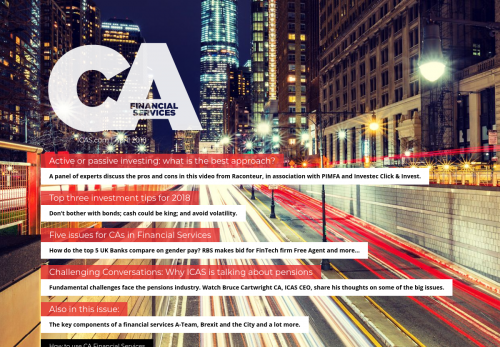 Watch Bruce Cartwright CA, ICAS CEO, share his thoughts on some of the big issues. The key components of a financial services A-Team, Brexit and the City and a lot more.